A Rugby woman has written a poem to inform residents they have until August 28 to speak against a proposed housing development on a controversial site south east of Brownsover Lane. Sharon Rowlands, who lives near the proposed site, penned the poem and distributed copies to residents to raise awareness about a proposal to build 14 houses on land next to the Brownsover Conservation Area. A section of the poem, called A plea of help from a little green field, reads: “Please help to stop them taking me away, for tomorrow’s children and those of today. “We can’t always see what history has left, and to protect it I’ve always done my best. “I have a sunken village and assets galore. Situated close to the medieval church of St Michael and All Angels, Lawrence Sheriff Cottage and Brownsover Hall, a section of the field is part of the Browmsover Conservation Area. The original proposal was for 36 houses, seven being affordable housing, to be spread across the field, with 19 being built in the section that is part of the conservation area. A heritage report said the importance of the conservation area at Brownsover is high. It concluded the potential harm caused by the housing development would not be substantial - meaning the local authority should weigh the level of harm against the public benefit rather than automatically refuse permission. The amended proposal is for 14 houses, none of which would be affordable housing, which avoids building on the section of the field that is part of the Brownsover Conservation Area. A letter addressed to Rugby Borough Council from Historic England states: “Without a substantial degree of public benefit there can be no justification for approving this scheme. The letter also branded the conclusion in the Heritage Assessment that the archeological potential is low as perverse - arguing the listed buildings and shrunken remains of a medieval village near the site are important. Archeological surveys have revealed what are believed to be the remains of activity on the site dating from between the 10th and 14th century. Mrs Rowlands believes these historical traces will be lost if building work goes ahead. 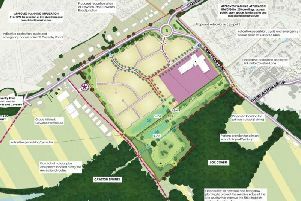 Anyone wishing to voice concerns about the development should email Nathan Lowde at Rugby Borough Council on Nathan.Lowde@rugby.gov.uk by August 28.